"What shall we have for lunch?" "I don't know, look in the fridge." "Ooo, yes, with cream cheese!" "... I could make Sushi...?" "Sure, why not? How hard can it be?" Unfortunately we only had regular, white vinegar and normal Bismati rice. Oh well, it can't be that different, can it? First, "wash" the rice by rinsing it out with cold water several times until the water is clear. Then cook the rice in a little water (about the same amount as the rice) until it's nearly boiled away, cover and steam for a further 10-15 minutes. Whilst this is going on, prepare the rice seasoning by measuring out some vinegar (about 25% of the amount of rice) and stirring in the sugar (about 1 tablespoon for every 50ml of vinegar). Once the rice is done, gently mix in the seasoning. Let the rice cool and you're done! Nigiri Sushi are the little handmade blocks of rice with a portion of seafood on top. Making it with the substituted ingredients turned out much better than expected and we enjoyed home-made Sushi for lunch. 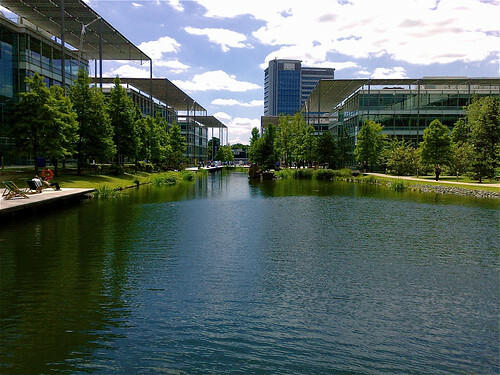 This week was my first week at European Directories, located in Chiswick Park, London. 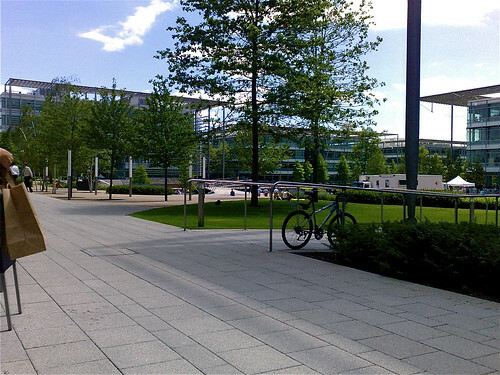 Here are a couple of photos of the business park, taken on my first day. The first week was quite busy and I was in Amsterdam on the second day. (after a slight hiccup with the outbound flight) The people are very friendly and everyone is trusted to get on with the tasks in hand. (another nice change!) Things will be even better when a couple of colleagues I've worked with in the past, join us.